Have tu read Puella Magi Madoka Magica: The Different Story? Is "Puella Magi Madoka Magica" your favorito! magical girls anime? Have tu seen the Concept Movie? 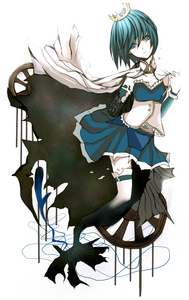 Some of my favoritos in the Madoka Magica universe; wich one do tu prefer? My three favorito! character themes; which theme do tu like the most? Elise: *Looks around* With Nick Wolfe out of the picture, now there is nothing that can stop us! Homura: And you're going to hold your end of bargain? Elise: tu mean to protect that Madoka girl? Yes. Hiyori: When shall Kasier arrive? Kaiser Jarek: *Appears* I have arrived! Elise: Kaiser! *Bows* It has been too long! Kyoko Sakura: *Jumps and lands on the parte superior, arriba of a house* Where are tu going? Homura Akemi: The better pregunta is, why are tu following me? Did that Wolfe guy send you? Sayaka Miki: So I heard that we might be getting a new student, what do tu think Madoka? I wave, saying "Well, see tu later"
otomonai sekai, nani o miteruno? in a world without sound; what do tu see? I'm searching for the face who will say "see tu again,"
I'll just be doing it over and over again. a comment was made to the poll: Out of my parte superior, arriba 4 favorito! characters, which do tu prefer? a comment was made to the poll: Which character is más unforgivable? Your wish and puella magi power?